I was recently sent a sample of nougats from Kettle Confections. They're a small business based out of New York. Their fresh almond and pistachio nougats are all natural - no artificial colorings, flavors, or preservatives. They have a lower amount of sugar than mass produced candies but you really can't tell the difference. I love nougat and and there's just something to be said about candy that is not mass produced. I enjoyed these straight of of the wrapper, but these would also be really good dipped in chocolate. I think my favorite flavor was the Pistachio-Cranberry French Nougats. - Mandatory entry: Visit Kettle Confections and leave me a comment, telling me what flavor you think you would like best. - Additional entry: I've just created a Facebook page for Good Eats 'n Sweet Treats. "Like" me and become a fan on Facebook and then come back here, leaving me a comment with your first name and last initial so I can verify that you have done this. If you're already a fan of Good Eats 'n Sweet Treats, then just leave me a separate comment telling me that you're already a fan (also leave me your name). - Additional entry: Tweet about this giveaway using this link and then come back here and leave the link. If you'd simply like to purchase some nougats on your own, the folks at Kettle Confections have set up a special discount code for readers of my blog. Just use code "sweets" to get 5% off your order! This giveaway is open to US and Canadian residents. Entries will be taken until midnight CST on January 18th and the winners will be announced on January 20th. Please make sure I have a way to contact you if you win! If a winner does not reply within 48 hours, an alternate winner will be chosen. Also note that comment moderation is in place and it may take some time for your comment to appear below. Good luck! I think I would like the Cafe au Lait French Almond Nougat the best, but they all sound great. The pistachio cranberry sounds delicious! Thanks for the giveaway! I liked you page on Facebook and added it to my favorite pages. Ooh, I think it is a tie between the almond vanilla and the green tea! The strawberry almond sounds good to me. I love nougat, picking one flavor is hard! The cranberry pistachio looks awesome, as does the black cherry almond. YUM! I like you on facebook. Marcy S.
The flavors all sound yummy. I think Green Tea Almond sounds like the one I'd like to try. 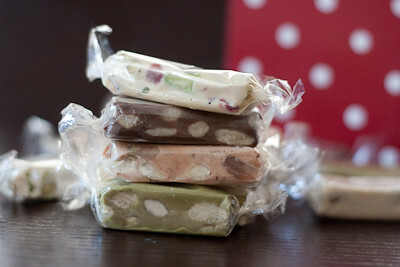 I think I'd like the Black Cherry Almond nougat best. How about the French almond-vanilla?! Sounds heavenly! I'd probably like the Strawberry Almond best. Cafe au Lait French Almond Nougat, sounds heavenly!!! Joined you on Facebook, under Lori K! 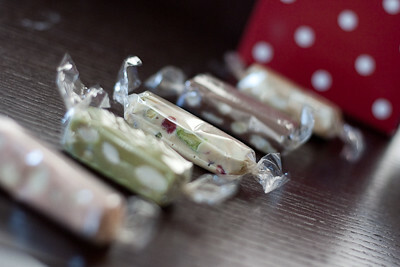 I would most like to try the black cherry and almond nougat. I think I would like the strawberry almond best. Black Cherry Almond sounds delicious. I "Liked" you on facebook. Keri T.
Pistachio Crenberry would be good too. strawberry ice cream almond french nougat sounds the best!